TheBlackBox: Release v2.0 - Propeller HSS FX/Sequencer with Digital Audio SPDIF output. This is to announce v2.0. Major changes, are use of a single eeprom and crystal. -future input of accelerometer, theremin, and piano interface. Plus other input methods. -uses VIEWPORT as a tool to do diagnostic and virtual interfacing. -each prop communicates at 250Kbps using the "fullduplexserial" object. This device is an audio waveform creation and 32 step sequencer. -Live fx mode to allow direct output of the current waveform set by 12 different potentiometers. -The sequencer allows the fx to be loaded into any one of 32 steps in the sequencer. 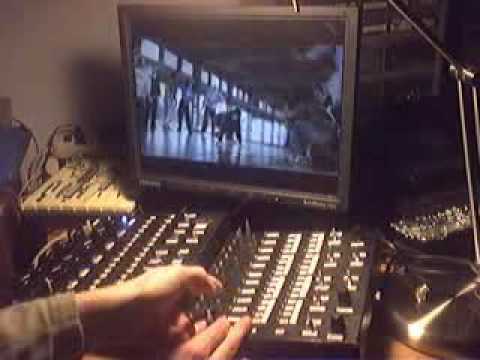 - analog output to a monitor(at the same time as spdif/analog output above (headphones or studio speakers) to allow auditioning before outputting live. - 2 leds that start/stop the sequencer and live fx waveform. - fully open source that uses the HSS code to generate the audio. - AudioSequencer(U1) prop uses all 8 cogs and has 18 I/O free. 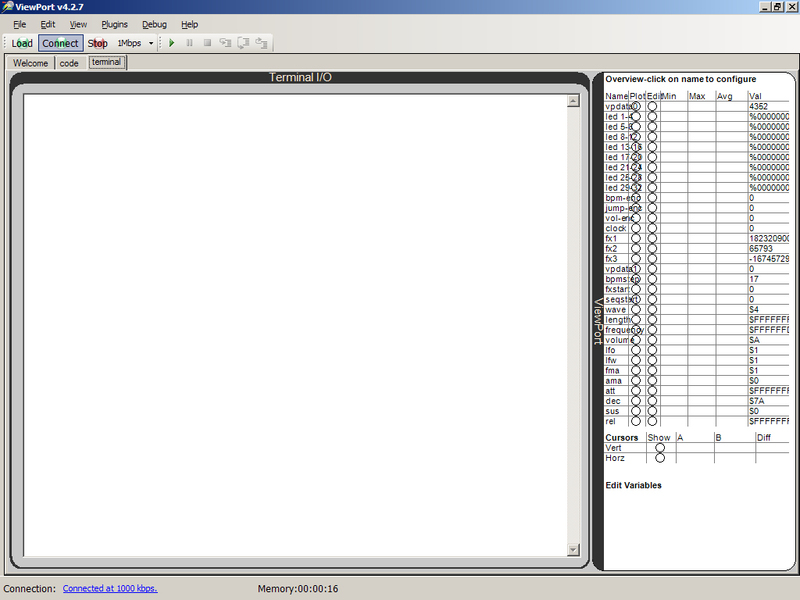 - PotReader(U2) prop uses all 8 cogs and has 6 I/O free. - LedReader16(U3) prop uses 5 cogs and has 8 I/O free. - LeadReader32(U4) prop uses 5 cogs and has 4 I/O free. Source Code:See attachment BlackBoxV2.zip fully commented. !- Lots of wire, time and solder. WATCH THESE VIDEOS TO SEE WHAT ITS ALL ABOUT. and his choice to give the code away for free has spawned this monstrosity. 3 - 1/8in audio jack. PROP 1: 8 cogs used. PROP2 - 8 cogs used. - talks to prop 1 (full duplex serial 115200) audio prop. Sends fx potentiometers, sends led states, sends encoders. - 2 cogs. Gets beat. - talks to prop 3 (Gets 1-16 leds)(fx start, seq start) Sends beat - 2 cogs. - talks to prop 4 (Gets 17-32 leds, encoders) Sends beat. - 2 cogs. - reads all other pots - 1 cog. Nice free hand work on the internals. Plus great job!! Now all I have to do is download your code an take a peek inside. I love the video's you provided a very nice touch to your completed project post.. If a robot has a screw then it must be romoved and hacked into..
What is the purpose of this project? What does it do? Watch the videos that are at the beginning of this thread. 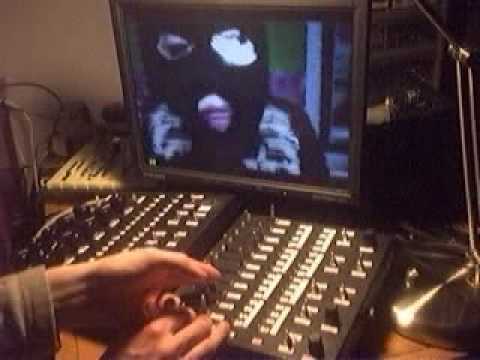 If you still don't get it, look up something called a drum machine, a synthesizer, and a sequencer. I cannot watch videos from my computer. Thanks for the info. Thanks! No project is complete without multimedia + code + schematics. Thanks, the prop makes it easy. Thanks, Yea, my method of prop communications isn't the greatest, but it works. I basically just blast the values over the serial, and on the receiving prop I have it look for the start number "say 113" and then after it sees that number, it starts to capture all the data after it for a certain number of bytes. Its pretty simple and allows me to transmit at 115200 baud. Although I use 2 pins for the serial I/O, it could be done with a single pin. This is because I do not use 2 cogs to transmit and receive the data, I do the TX and RX sequentially. Re-use the TX and RX lines between props as a way to upload the boot program from the master prop, plus do the serial communications on the same lines, after the boot program has been uploaded. This is the result of an EE who is out of work due to the financial terrorism that the federal reserve and federal government have chosen to inflict on the hard working class. I.E. my job canned me due to cut backs. (insult to injury, the state refused my unemployment claim over a technicality) (combine that with the housing market prices....which resulted in my foreclosure, etc...) Its a horrible time to have lost a job, and owned a house. Wheres my bailout? See first post in this thread. The file attached is the viewport output. I don't understand viewport very well yet. But I hope I can include a virtual interface to the black box using viewport. 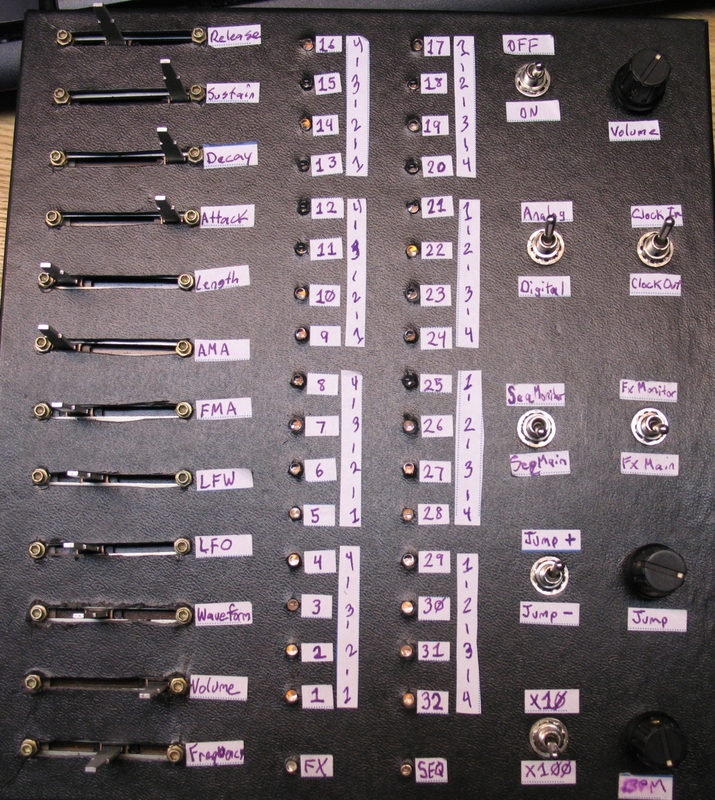 The image attached is the second box that was also made by freehand wiring. This would have been done with a pcb if funds were not limited. 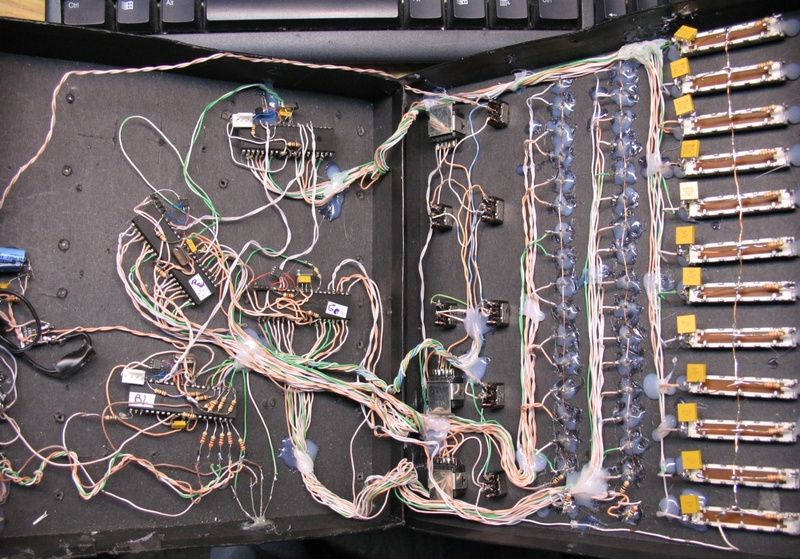 I'm even more impressed by your use of solid core twisted pair to wire your project. have had it break internally making it a pain to locate a faulty connection. You have to pull all the wires out of the plastic at once. DO NOT USE THE STRING. Then separate them carefully. The bundle of wires along with the string tears the plastic. But the string alone will kink wires and pull them, possibly causing internal breaking. It depends on how old and abused it is. My stuff is from an office, about 10 yearold cat5. I have added two images that include two ccfl tubes, and an inverter to provide the light for the led detection. Looks like someone has more time (junk and parts) on their hands than me. Nice links, but the items you linked are not really anything new. One was a led spiral wired without a pcb. The last was a tube amp of some sort. Perhaps someone could make a tube amp with the prop, but not me. I just focus on using the prop projects with a minimal amount of other parts. The fact that I don't use circuit boards in my design is due to cost, not due to a lack of skill or capability. I would like to use circuit boards, it would sure save me many many many hours of wiring. 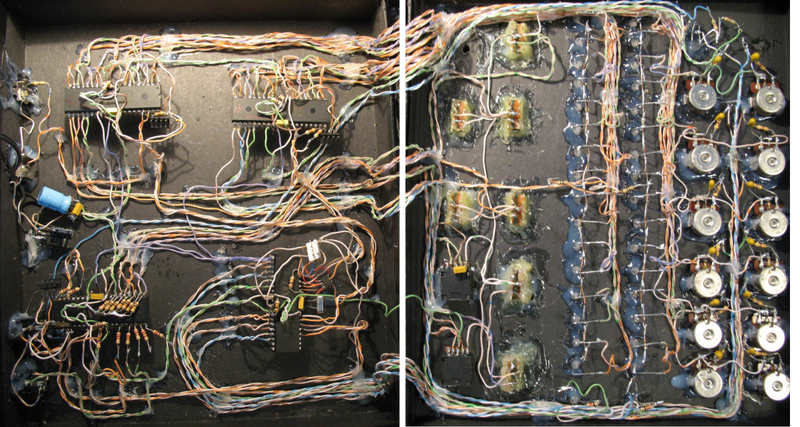 But I am getting better at making the wiring neat and organic looking. Moderators, feel free to move this to Projects... Its not robotics, its a music synthesizer.. More of a project than a robot? I watched the demo video on the hackaday site, you should link that over here too. Do you have any songs you made with it? 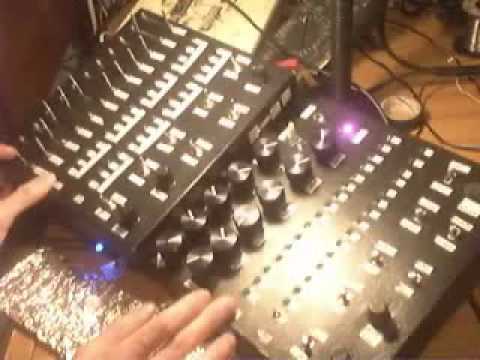 Haven't made any songs .. i did a mix with the video of "jason nevins its like that".. i played two of the "blackbox", clock synced, live..
Its challenging and fun, what I would really like to try is like 10 of them all linked up. Most of what you saw on hackaday was what i have.. on you tube. 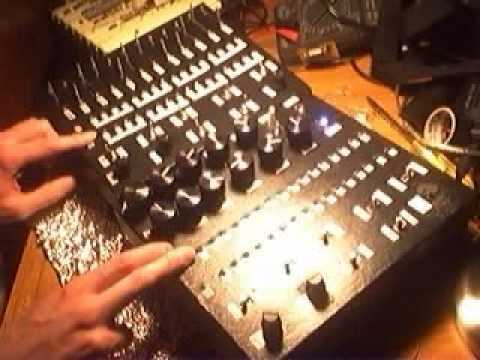 It was mostly improv on what dials and sounds I played at times, once you play an instrument enough you can do stuff..